The Buffalo Bayou Park maintenance team begins cleanup along Buffalo Bayou. It has been truly heartwarming to see how Houstonians and people from throughout the country have expressed their concern for Buffalo Bayou. While the waterway was greatly impacted by the historic flooding, our organization remains committed to its mission of transforming Houston’s most significant natural resource. Buffalo Bayou Partnership (BBP) oversees revitalization efforts along a 10-mile stretch of the bayou from Shepherd Drive on the west to the Port of Houston Turning Basin on the east. 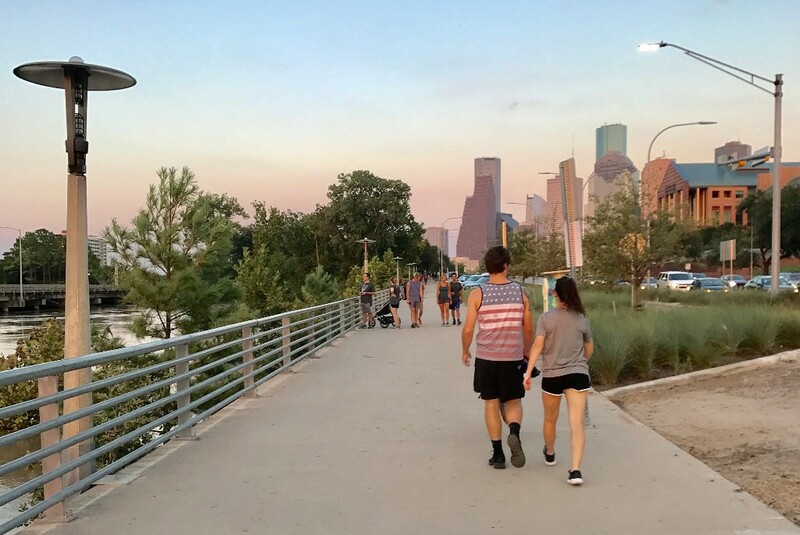 Within this area are high profile greenspaces such as Buffalo Bayou Park, Sabine Promenade, Sesquicentennial Park and Allen’s Landing, as well as a continuous hike and bike trail system. Much of this area BBP maintains and operates. East of downtown, the organization owns property, has constructed approximately four miles of trails and a nature park, and operates a Field Operations office that houses boats used for removing trash and debris from the bayou. Due to the number of inquiries we have received regarding the condition of Buffalo Bayou, we are providing this latest status report. Buffalo Bayou Park was inundated with water that rose a record 38.7 ft. at the Shepherd Drive Bridge. The upper portions of the 160-acre park survived remarkably well with only small amounts of debris, and very little damage to the perennial gardens, trees, and prairie and wildflower areas. Trails at these higher elevations are open and we are pleased that so many people are getting out to walk and run. We are extremely fortunate that the Lost Lake and Wortham Insurance Visitor Centers did not take on water. Both facilities are open and the Kitchen at The Dunlavy is operating with normal hours. Food trucks also are back in the entry court at Sabine Street from Thursday-Sunday. Bayou City Adventures has suspended all canoe/kayak rentals for the remainder of the year, and Bike Barn is not operating until further notice. The bottom two thirds of the park are still under water, and we expect that they will remain so for several more weeks as water is released from the Addicks and Barker reservoirs. Due to these circumstances, it is difficult for our staff to assess the impact the flowing water has had on the footpaths and landscape in these areas. We do know that the Johnny Steele Dog Park, which is still submerged, will be closed for two or three months. Staff began cleanup out in the park on September 6, concentrating on areas that could be accessed. Immediate work is being done to clear silt from the upper concrete trails, remove fallen trees, and pick up trash and debris. Damage has been done to the park’s Wortham Fountain and trail lighting system. Staff plans to begin lighting repairs at Lost Lake and The Water Works first and then proceed down Allen Parkway. We have had many inquiries about the Cistern. Water and sediment did enter the site and it is slowly draining. The electrical system seems to be in working order. Another very unfortunate outcome from the flooding is that BBP lost the majority of its equipment (mowers, golf carts, Bobcats, etc.) at its Memorial Drive maintenance yard. Please know that Buffalo Bayou Park was designed to flood, although we did not anticipate three historic flooding events in 1 ½ years. Working with the Harris County Flood Control District, designers from SWA, the park’s consultant firm, created a landscape that helps channel runoff and provides greater flood water conveyance capacity. Park amenities such as signage, benches, trash receptacles and stair railings were constructed with extremely durable materials such as stainless steel, Cor-Ten and concrete to withstand the enormous amounts of debris that flow down the bayou during major flooding events. Water is still flowing very heavily from Sabine Street to Allen’s Landing and beyond. There are very few trail segments that are not under water. Thus, until further notice, we ask that the public not use the trails in this section along the waterway. Allen’s Landing and buildings along lower Commerce Street were inundated with water. We were fortunate that water did not enter our Sunset Coffee Building at street level. The ground level, home to future boat and bike rentals, was submerged but operated as it was designed with flood waters flowing through the overhead mesh doors and out into the bayou. Due to flood damage in this lower area, repairs are needed to the fire alarm system, elevator and other electrical systems. East of downtown, Buffalo Bayou experienced significant erosion and bank failures resulting in the collapse of some trails. Our Field Operations headquarters was impacted with the loss of a boat, floating dock, and various equipment used for bayou cleanup operations. A dock used by the Rice Crew Team and Texas Dragon Boat Association also floated away due to the flooding. While Hurricane Harvey has greatly impacted Houston’s historic waterway, Buffalo Bayou Partnership will not be deterred. Please know that our maintenance team will work as diligently and swiftly as possible to repair the damage that has occurred along the trails and parks that we maintain and operate. We ask for your patience. We all realize that the storm has greatly impacted thousands of Houstonians and they will be focused on rebuilding their lives. However, as the weeks and months proceed, we do hope that you will take time out to visit Buffalo Bayou and other greenspaces throughout our city. Whether it’s a walk, run or time of contemplation, the parks and trails are places where people from all walks of life come together. While you will be seeing our staff out and about in Buffalo Bayou Park and along downtown trails, please know that we also will be working behind the scenes to analyze and document the flooding and erosion impacts downstream as part of our Buffalo Bayou East Sector master planning effort. Through this new project, we are in a unique position to play a major role in demonstrating how Houston can be developed sustainably and holistically, with resilient neighborhoods integrated with open space. Buffalo Bayou Partnership is committed more than ever to our mission and to the broader civic values that our city needs as it moves forward to rebuild our great city.